WARNING: Do not continue reading this post if you are entomophobic. I fell sick after consuming too much durians. I guess my body is not used to the “heatiness”. Paul was alarmed when I told him that the night we met for Supermoon. He defended, “Don’t tell me you were sick because of the durians. It’s delicious. People pawned their sarongs just to eat durians!” I liked the taste, too, but my body did not agree. Well, I was also caught in the rain thrice and that could be it (causing me to fall ill). Anyway, I was down with fever and cough (still coughing but almost cured now). The first week was spent lying in bed. After a couple of weeks, I told myself there’s plenty of time to lie down when I die. I did not participate in any night macro outings but I was glad to “sneak” out one Tuesday morning with Yama. 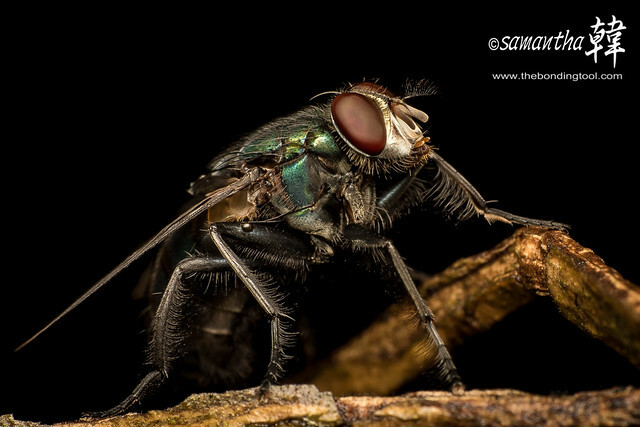 We wanted to shoot robber flies but there was none. 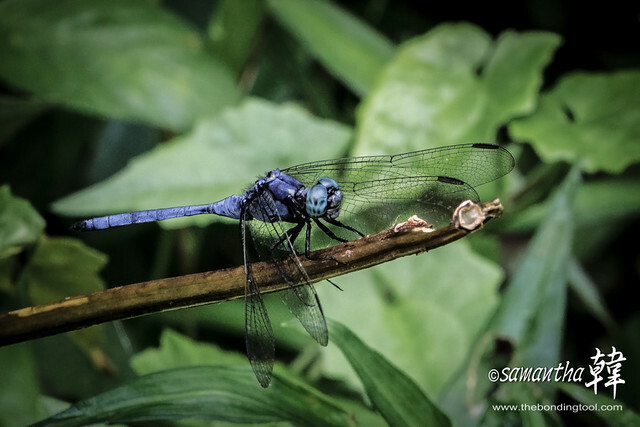 After an hour or more, we switched to another location and took pictures of dragonflies and damselflies instead. 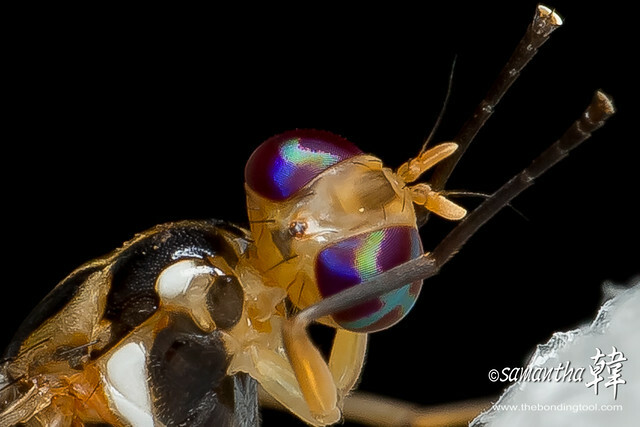 I wasn’t happy with the previous shots I had of the Robber Flies. The eyes were not properly lit and this one’s eyes looked damaged, so Yama and I wanted to capture better shots. We had no luck that morning. 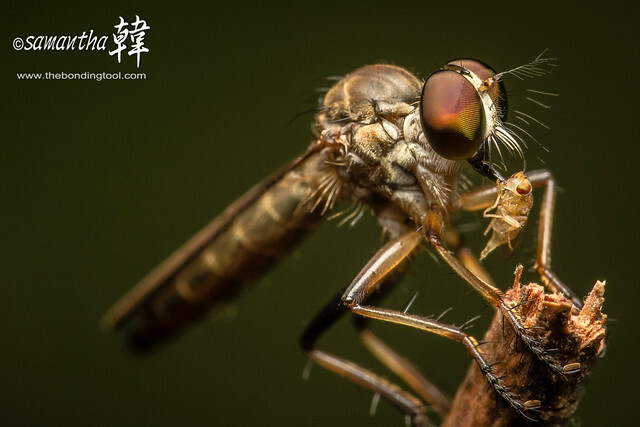 The robber fly, aka Assassin fly, hunts down other insects in mid air and stabs them with its short but strong proboscis. 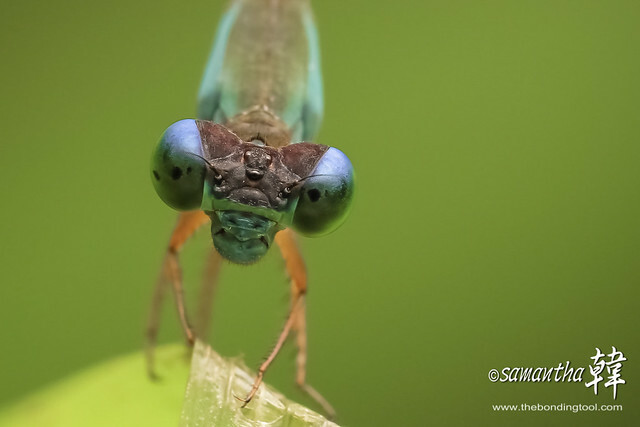 Damselflies are insects in the order Odonata. They are insects in the sub-order Zygoptera (meaning “paired-wings”) where all four wings are near enough equal in size and shape. 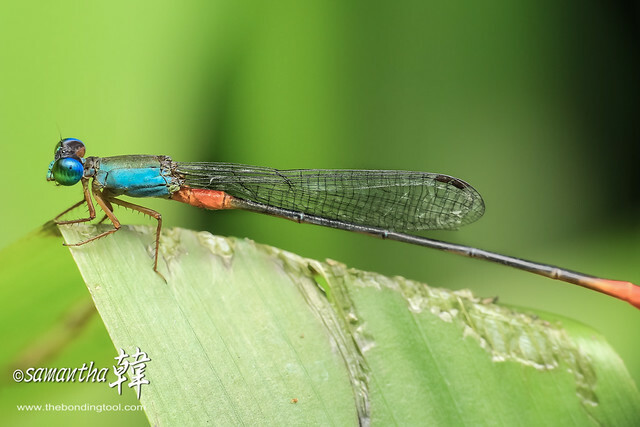 They are usually small, weakly flying insects that stay close to the water margins or water surface. 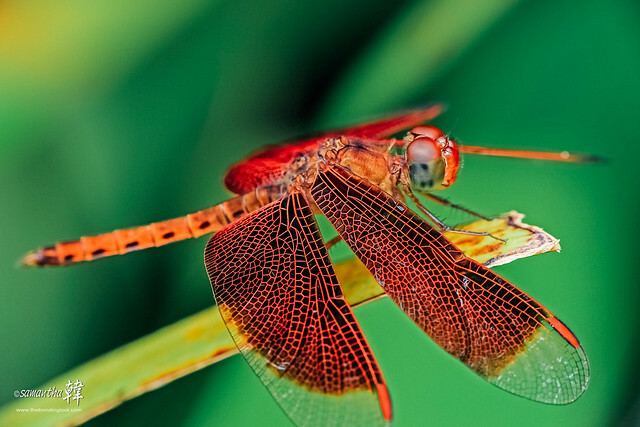 Dragonflies are insects in the sub-order Anisoptera (meaning “unequal-winged”). Hind wings are usually shorter and broader than forewings. 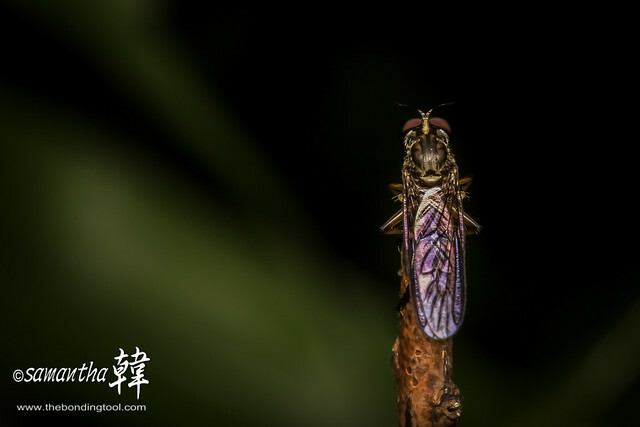 They are usually large, strongly flying insects that can often be found flying well away from water. When at rest, they hold their wings out from the body, often at right angles to it. Different colour but still a Dragonfly. 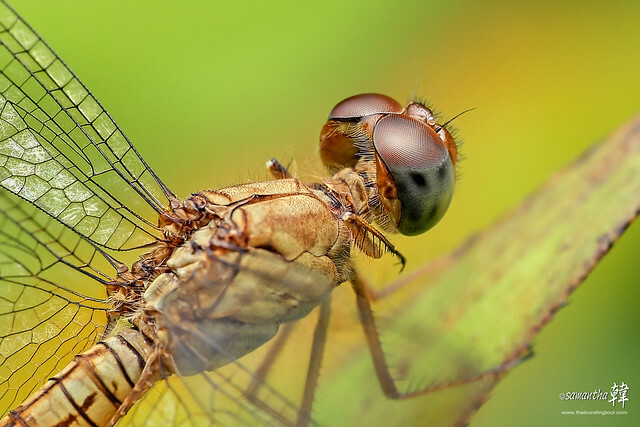 The eyes of a Dragonfly are very large and usually touch, at least at a point. 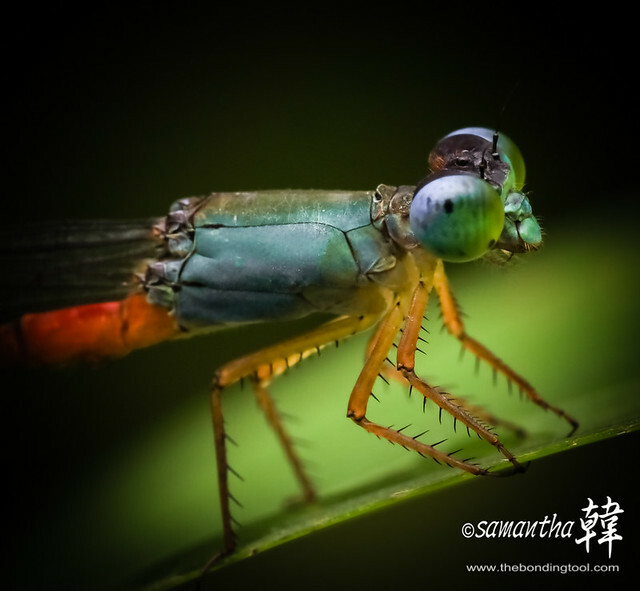 Is this a Damselfly or Dragonfly? The light diffusion was pretty good on this one but some details were not properly captured in the eye. 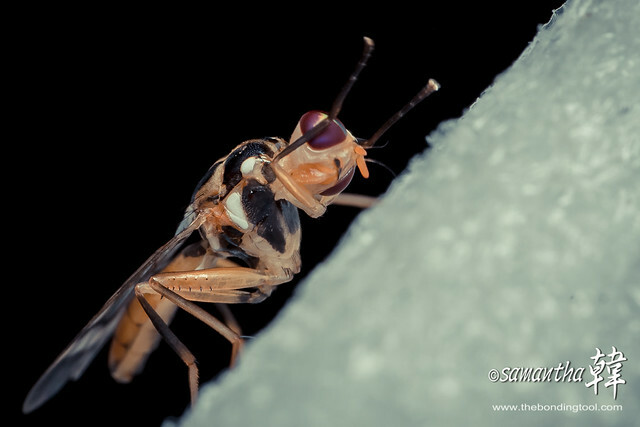 The Asian papaya fruit fly is about the same length as a common housefly but is more slender. 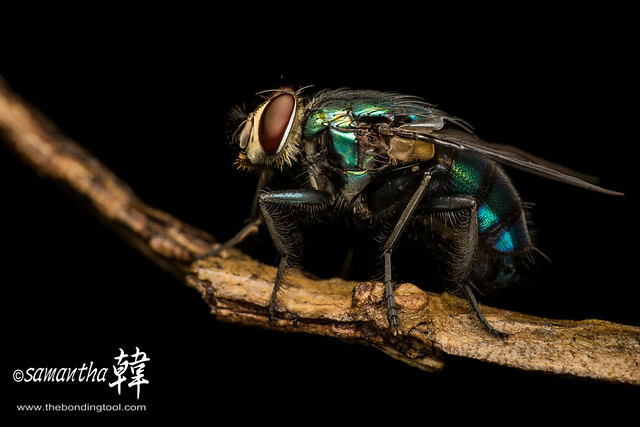 This one landed on Chu Chen’s foam and he asked if I would like to take pictures of it. Of course! I would love to! 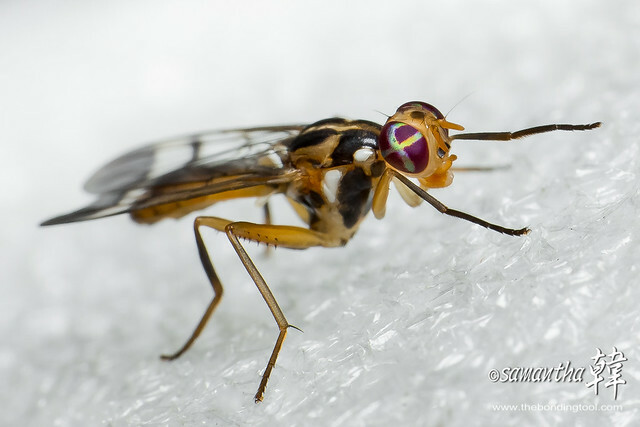 Although the Asian papaya fruit fly (Bactrocera papayae) looks exotic with its colourful eyes, it is a serious quarantine pest worldwide, and especially so in Australia. It can and will readily attack most species of edible fruits and fleshy vegetables. I guess some of you are freaking out by now. Bugs and grub is hard to swallow but they are my two love… Anyhoo, let’s get back to supper! The dishes, as I mentioned were the same except for two new items we had as there were more people eating that night. I seldom consume canned drinks but I was parched after several hours of macro. I asked for green tea and this was served cold and with a glass of ice, too. 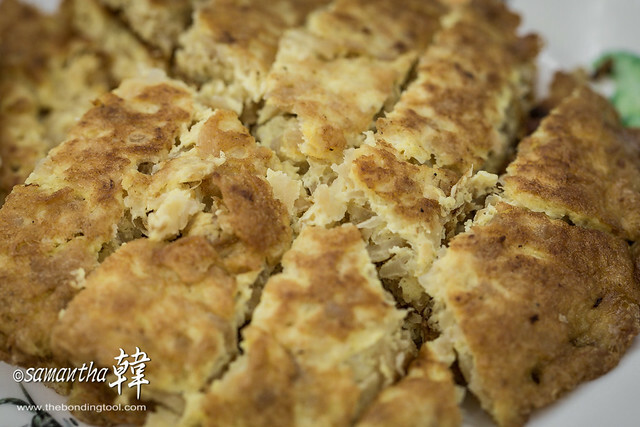 Bak Yee is Teochew Porridge style fish cakes that contain some pork and pork fat mince. I put up this photo as they look more coarse in texture but surprisingly more tastier this time. 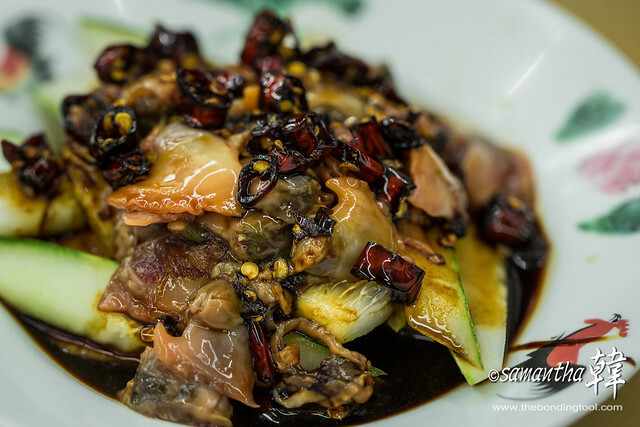 We also had this cold cockle dish on our last visit but tonight’s seemed unusually spicy. A few of us actually enjoyed the extra kick. 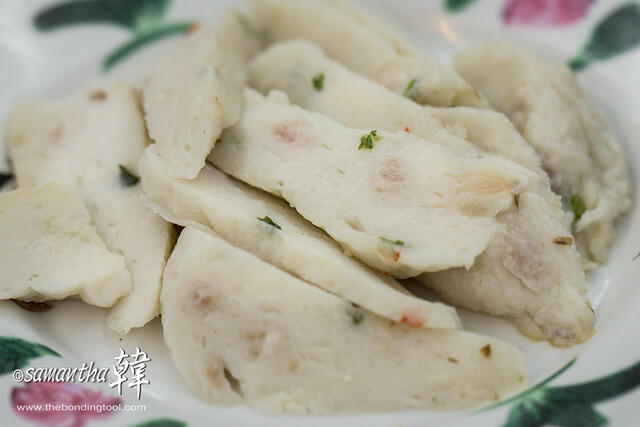 Chye Poh Omelet is beaten eggs with preserved turnips. These had chunky bits of savoury sweet crunchy turnips inside. 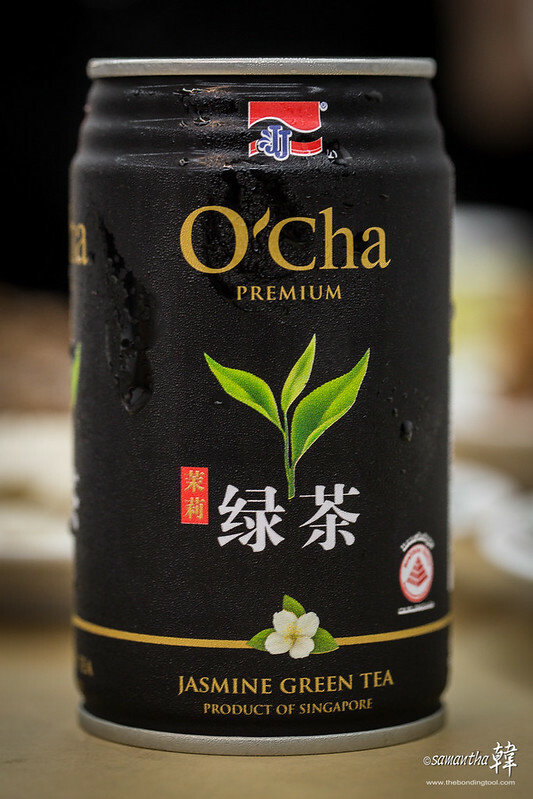 This was one of the new item we had from Joo Seng (being my second trip). 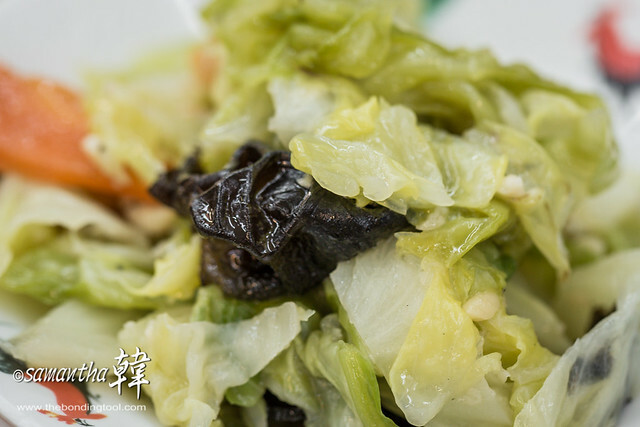 Chap Chye is mixed vegetables with cabbage as the main ingredient. This was the second new item we tried. 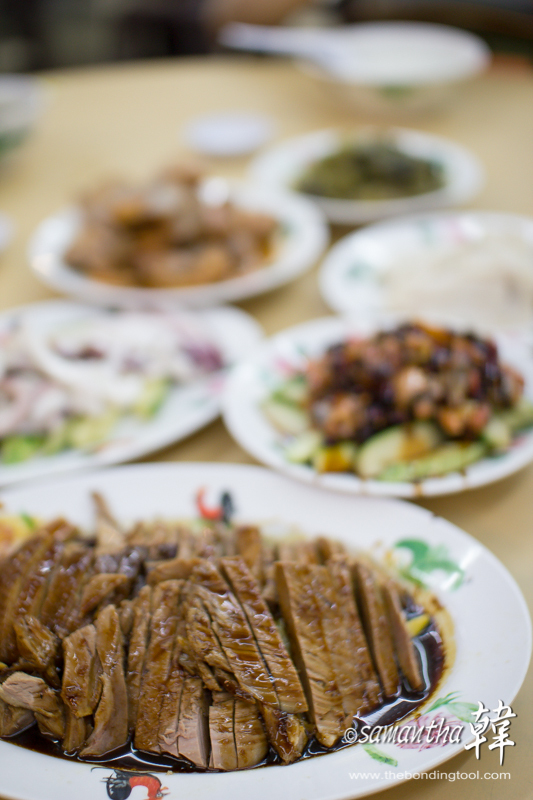 We also had Boiled Squid, Braised Duck, Chilli Lala and Preserved Vegetables, same dishes as previous visit. All the dishes were yummy! We forked out S$6.30 per person (inclusive of 8 bowls of rice porridge and several drinks). Photo was taken on hp by the lady staff at Joo Seng and courtesy of Andy Liau who tagged me in Facebook. Address: 11 Cheong Chin Nam Road (Upper Bukit Timah). Flies and lies… I rather fly than lie (down). Click here to view my first visit to Joo Seng Teochew Porridge 裕成潮州糜. 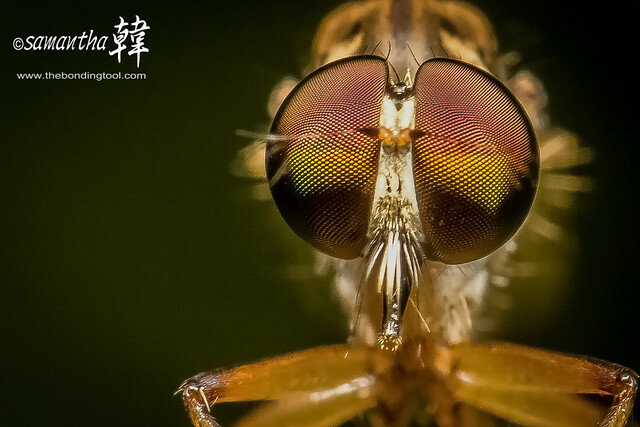 Click here to see my first outing with Peter Lee and the equipments I use for macro outings. Click here to see the durian feast I had with Paul at Sands. ← Poulet – French vs Italian! Bugs ??? All of God’s creatures demand some respect. 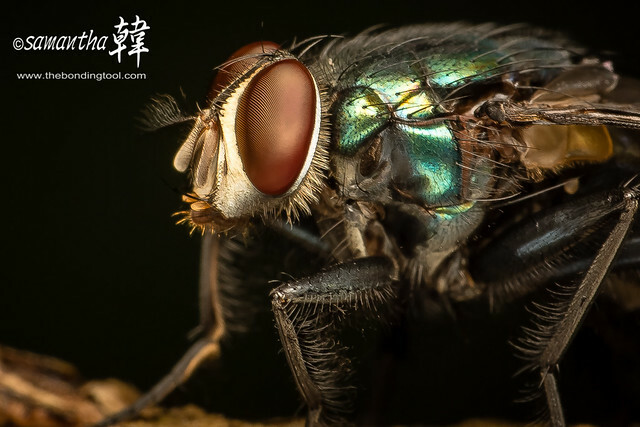 Bugs and food in the same post? 🙂 Great shots.